The Dillin Capping Systems: Model 59-300 Single Head Steam Capper applies metal or plastic closures to glass containers. 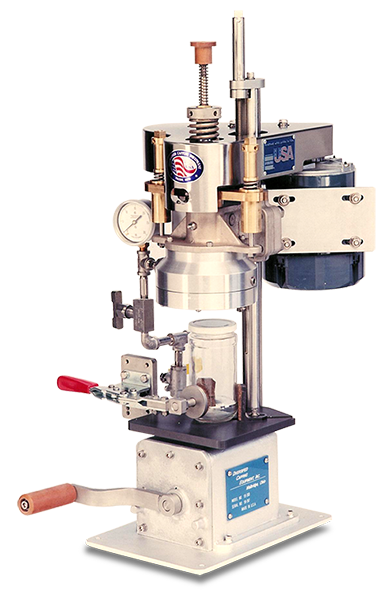 It is used for laboratory, experiment, test pack or where small quantities of products such as baby food, vegetables, fruits, orange juice, jams/jellies, salsas, spaghetti sauce, ect. Must be packed under steam vacuum. First, the filled container, with the cap lying loosely on the finish, is manually placed on the table. Then the container is clamped against the guides with the toggle clamp. A magnet is lowered by pressing down on the knob at the top of the machine. The magnet picks up the cap and raises it up into the head steam zone where steam is injected between the cap and container. The table is raised by means of a cam and handle located on the front of the machine. The container is raised up to the head and into contact with the cap. The rotating rubber chuck applies and tightens the cap. (Note: Torque can be adjusted by the head load springs.) After the steam cools a vacuum is created in the container. A push cap can be applied if the motor is not utilized. Finally, the table is lowered and the capper container is removed.